Hello everyone, CEO Olivia here. Today I have a serious topic. It’s spring & that means kitten season. Each year, usually starting in June, shelters & rescue groups are inundated with homeless kittens. Sadly, with such numbers, too many will be euthanized. It’s a terrible situation. Most animal shelters are already stretched to their limit at the best of times. With kittens coming in off the streets, the risk of illness in the shelter increases. Most feral litters aren’t healthy. 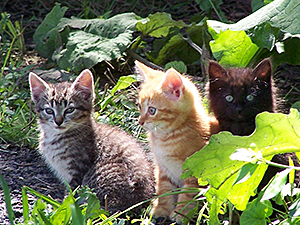 It’s common for feral kittens to have conjunctivitis & upper respiratory infections. Although both illnesses are easily treatable with antibiotics, infected kittens are usually euthanized. Shelters simply don’t have the budget or resources. During “kitten season” the chances that an adult cat in a shelter will find a home typically drops—they get overlooked by potential adopters when cute kittens are in abundance. What can be done? There are many ways you can help. First, spay or neuter your cat. It really is that simple. Consider a donation to a local shelter. They are always in need. You could buy food or litter or simply make a cash donation. You could also volunteer & donate your time. Kittens need to be handled so they aren’t fearful of humans. If there are feral colonies near you, find out if there is a Trap Neuter Release program (where feral cats are trapped, spayed or neutered then released back into their colony). Maybe you could help out by doing vet runs. You can also become a feral colony caretaker, providing food & shelter. Consider fostering a mother with kittens. This will ease some of the overcrowding at the local shelter. But be careful, kittens are very easy to fall in love with. Finally, adopt, don’t shop. When you adopt from a shelter you enrich 3 lives, yours, the animal you adopted & the one you just made space for.